The DU program was started in Tunisia in 2005 and counted on four operational labs equipped with laptops, printer, web cam and scanner. DU teachers completed their training under the guidance of ST Tunisia voluntary ICBF (Informatics and Computer Basics Facilitation) trainers. The labs of Jendouba and Bou-Salemare located in the North-west of Tunisia were set up in cooperation with the association Anciens des Lycées Liberté et 9 Avril 1938. They spearheaded the ICB (Informatics and Computer Basics) program to pupils, students, unemployed persons or administration employees with good results. The Program was often followed by the local press, which allowed visibility and encourages participation. In the South of the country, in Gafsa, the partner for the launch of the DU Program was the Club UNESCO ALESCO, an association sharing UNESCO values and also involved in environmental and social projects in its area. Students, particularly girls, were the recipients of computer literacy classes here. Since its setup in November 2007, this lab trained more than 530 participants. Another partnership with UNESCO ALESCO was launched afterwards in the town of Sidi Bouzid. Computer skills enabled former participants with a DU certificate to have a better chance of finding a job, particularly in public administration. Those who already had a computer at home also profited from the training. 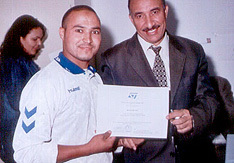 The Foundation’s computer literacy course was provided in French and explanations were at times provided by local trainers in Arab to make the course easier for a Tunisian audience. Outside course hours, trainees also benefited from access to the Computer Training Center and the Internet. DU Tunisia reached over 4’200 beneficiaries till the end of the program in the first quarter of 2012. Video: ST Foundation staff in Tunisia. This video was prepared by one of STF local partners, the association Anciens des Lycées Liberté et 9 Avril 1938, and shows an ICB course taking place at the lab of Bou-Salem.